Weight: 55 pounds || Sail Area: 39 sq. ft.
As her name implies, I designed this boat as a tender for a bigger one, a purpose which she serves very well. My requirements were for a dinghy that would be a good load carrier, able to ferry the bigger boat's crew and gear ashore from an anchorage, that would be light enough for one person to carry above high water mark, and that would row easily into a steep harbor chop when the occasion arose. The latter requirement pretty much precluded a pram. Prams are popular as tenders, being able to carry a good load, but rowing into a head wind can be very wet, hard work. Grace's Tender is much more at home than any pram in a head sea. 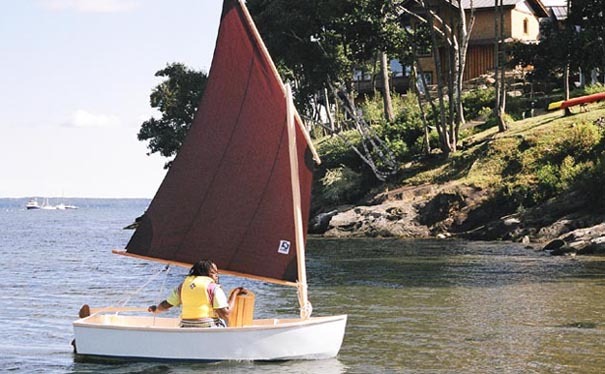 More than just a tender, this little dinghy has turned out to be a fine vessel in her own right. She is a pleasure to row, and sprightly under her simple sailing rig - a great boat for youngsters to mess about in. Length 8' 0" | Beam 4' 0" | Draft Board up 5", Board down 2' 0" | Sail area 39 SF | Weight 55 lbs. She is also an excellent teaching tool. The prototype was built by my daughter, Grace, when she was ten years old. 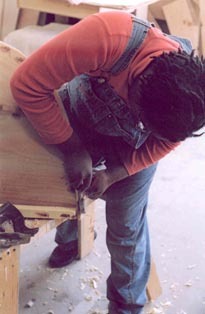 The construction method uses sheet plywood in the conventional way, with a set of three temporary frames on a strongback, a keel, and chines. The frames are removed after planking has been completed. If this is conventional plywood boatbuilding, it is boatbuilding reduced to its most basic elements. The strongback is a simple T-section, made from two boards; the frames slot onto it to make setting up a very straightforward, accurate, and foolproof procedure. 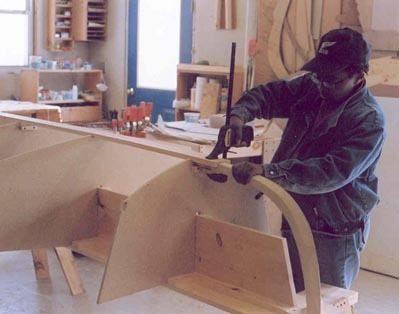 The strongback rests on a pair of sawhorses while you are building the hull; you add keel, chines and planking, then turn the boat over and remove the strongback and frames before adding seats and a daggerboard trunk (if desired). At the end, the builder has had a good introduction to the essentials of boatbuilding as applied to much bigger, more complex vessels. The full set of plans consists of full size patterns, scale construction drawings, and a step-by-step building manual. The latter includes complete lists of materials and tools, a discussion of suitable types of wood and plywood, sources for marine plywood and hardware, and is illustrated with well over 100 photographs and drawings. I am confident that this is by far the most comprehensive package for any design of this size. In addition, the plans are back up by a free advisory service. The two hour DVD gives a detailed took at every stage of construction. Watching Grace at work will be an inspiration to any young - and not so young - builder. 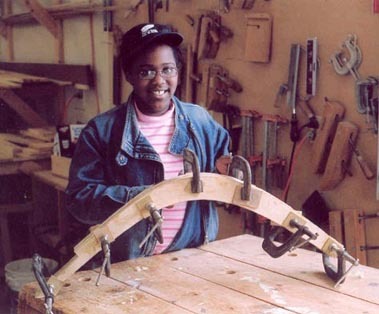 You need some basic woodworking tools to build Grace's Tender - a plane, chisels, handsaw, jigsaw, drill, and measuring and marking tools. The materials list includes two sheets of 4mm plywood, a piece of ½" marine plywood for the transom, epoxy resin, ½" particle board or plywood for the frames, and some lumber and stainless steel screws (your local lumber yard should have what you need). 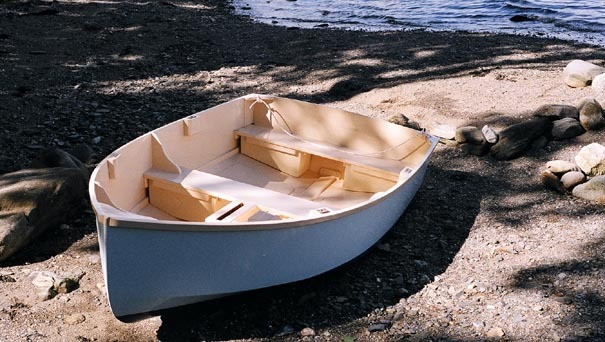 The kit provides basically everything you need to build your boat - plywood, lumber, epoxy resin, and fastenings. 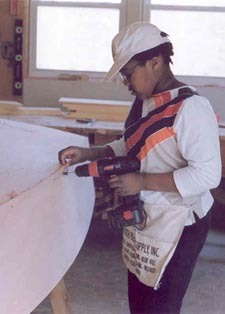 The frames, stem, and transom are cut to shape, ready to set up on the strongback (also included). Keel, chines, and rubrails and ripped to size, ready for installation. About the only items you will need to obtain for yourself are paint, oars, and oarlocks. Rowing and sailing versions of the kit are available. The epoxy kit comes from System Three Resins, and provides you with all the resin, hardener, additives, brushes, gloves, and other items, that you will need. The System Three Epoxy Book, which gives detailed information on mixing and using epoxy, is included. (Epoxy solvent is not included, due to shipping restrictions. Hardware stores carry acetone or denatured alcohol, for use in cleaning up uncured epoxy). $229.41. Please call for shipping and handling. The boat in a box - all the plywood and lumber (cut to shape where appropriate), epoxy resin and fastenings (just about everything except paint - see above). Rowing kit: $1,295.00. Sailing Kit: $1,500.00. Please call for shipping and handling. Sails, rigging kits, hardware, and other items. Please call for details.